This wire organizer is shown below as part of the VC-01 Mobile LCD monitor Computer Workstation. 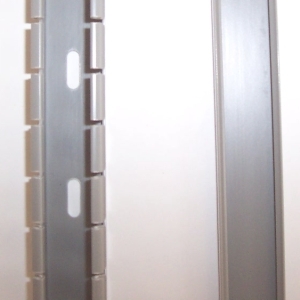 Short 13" sections are available for all wire-organizing needs. The cables are inserted into the 1 x 1 square tubes by un-snapping the rear wall. 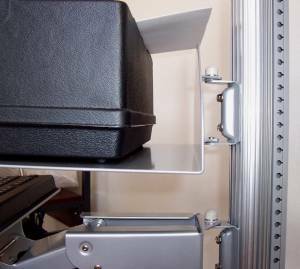 The cables access the equipment through the open end holes, spaced at 0.5" intervals, with a diameter of 0.25". 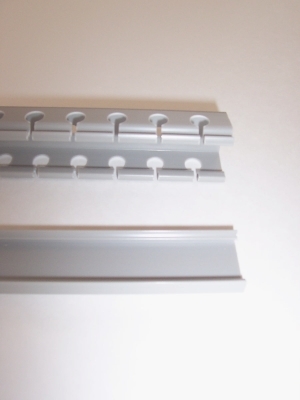 The conduits attach to any surface via screws (not supplied) through the 0.25" x 0.75" holes on the rear wall, or also can be attached with autoadhesive Velcro purchased at any hardware store. * 17 Lateral open-end holes to enter or exit cables to peripherals; Hole Diam. : 0.25 " / Separation: 0.5"
* Removable snap-on rear wall to facilitate running the cables.